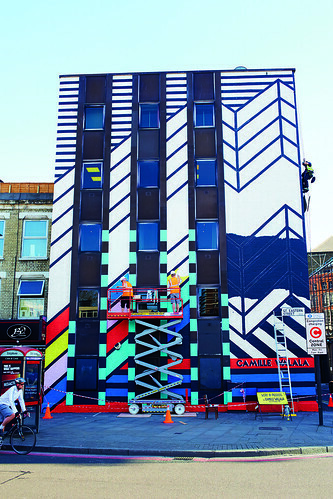 One sunny day in May 2015 Camille Walala arrived with a volunteer crew at a nondescript building on Old Street in London and started painting. Despite its reputation for tech start-ups, underground music venues and hipster coffee shops, the Silicon Roundabout neighbourhood is remarkably dreary, with worn-out buildings, uncharismatic shop-fronts, noise, dirt and intrusive billboards. 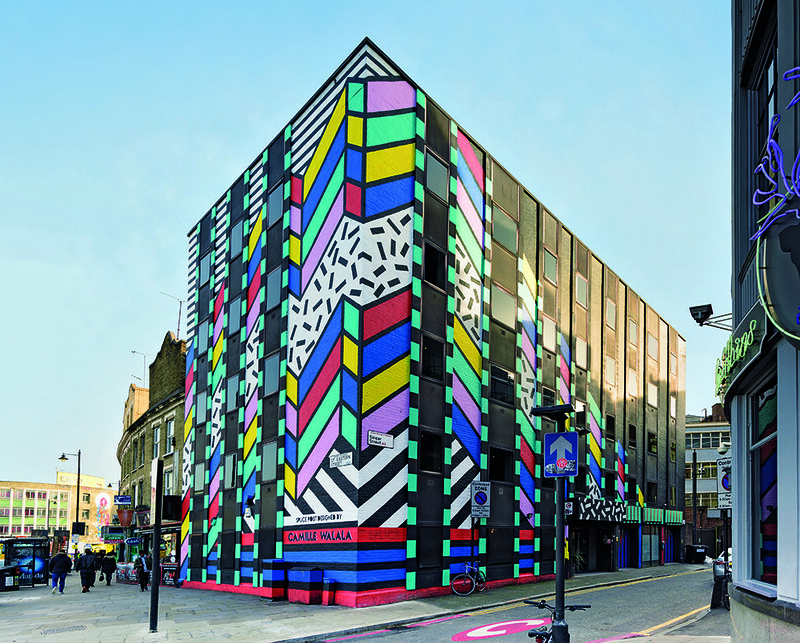 Walala’s mission was to introduce colour, and her transformation of the five-storey building, currently leased by post-production company Splice, was a gift to both the local community and the growing hordes of visitors drawn to the speculative glamour of London’s East End. She is not the first street artist to leave her distinctive mark on the area. In adjacent streets you can see extensive, entertaining murals by Stik, Phlegm, Otto Schade, Thierry Noir and Eine, and Walala had already decorated several walls around East London. But the Splice building was her first three-dimensional design, the first time she had had to visualise the effects of painting more than one side of a building, and the first project on such a daunting scale. The seeds of the project, initiated by photographer Jenny Lewis, were sown via social media. Walala and Lewis met and became friends through Instagram and exchanged messages for many months before actually meeting in real life. Lewis recalls that she could see from Walala’s Instagram that they liked the same kind of bright colours, lipsticks and clothes. ‘Camille’s breakfast looks like her work,’ she says. Lewis, who has recently received acclaim for her One Day Young project and book, is married to Duncan Western, creative director and co-founder of Splice. The company had moved to the Old Street building a few months earlier and established a gallery space, for which Lewis became unofficial curator, in its public spaces. Work in progress at Splice Post in Shoreditch, East London. To access the exterior, Walala made use of ladders, scissor lifts and Marcin, the abseiling windowcleaner. Photograph: Jenny Lewis. Top: This undistinguished office block, originally black and cream, was painted black all over prior to its transformation. Photograph: Ed Park. When the idea of painting the building came up, Lewis suggested Walala. Western sold the idea to his colleagues, including partner Damian Dolniak, bought the paint and put a schedule in place. Walala then put out an open call on Instagram, asking for people to help on a ‘dream project’. 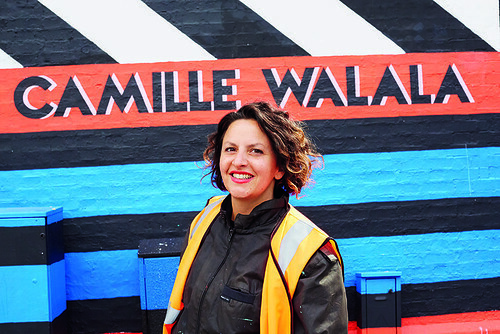 From 60 replies she assembled a team of eight, including two women from Cardiff who took time off to come to London, signwriter Jack Lewis, who painted the letters, and graphic designer Julia Jomaa, who was Walala’s main assistant. When I visited the site in June, Marcin the windowcleaner, whose usual job takes him up and down skyscrapers, was dangling from a rope, painting Walala’s ‘sprinkles’, oblongs whose outlines were defined by a wooden plank he angled against the wall to Walala’s yelled directions. Her introduction to street art came via a boyfriend, a street artist doing work in Melbourne, Australia. 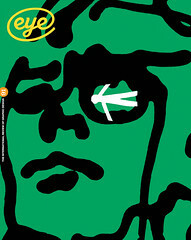 At that time Walala was a fashion illustrator. Seeing the way her boyfriend went about making work in public spaces gave her the confidence to transfer what was formerly on paper or fabric to the larger canvas of a wall. Before long, Walala had built up a portfolio of increasingly ambitious street art. The owner of XOYO, a Shoreditch nightclub, asked her to decorate a massive room with a high ceiling. Walala, conscious that she ‘didn’t have the skills of an interior designer’, took a photocopy of her fabric patterns and copied them to the larger surfaces. Later, Melbourne shop Third Drawer Down commissioned her to devise a big window display, and in London, a recently widowed woman named Georgina asked her to paint the back of her terraced house (which Walala calls ‘Georgina’s Happy House’). The Shutterbug restaurant / bar in Rivington Place, Shoreditch, asked her to paint the wall of their terrace. Her most recent London projects include Queensbridge Primary School in Hackney and Aria in Islington. Other projects include clothing, footwear and smartphone cases as well as commissions, and her first gallery show, alongside Thomas Koenig, at Espace Quark in Geneva, Switzerland, from 15 January – 25 February 2016. Work often comes via Instagram. For both Walala and Lewis, the app is an invaluable element of their professional lives, a place to show their portfolios; find collaborators; and make contact with art directors and potential clients. ‘You end up surrounding yourself with the people you like,’ says Lewis. In the Splice building, Walala has created an example of public art that bypasses most of the usual limitations and compromises. Though its origins lie in social media, the result is robust and memorable. What she calls the ‘Walala Dream Come True’ building has quickly become an unmissable element of the Shoreditch streetscape. Designer Camille Walala pictured in front of lettering painted by Jack Lewis. Photo: Jenny Lewis.